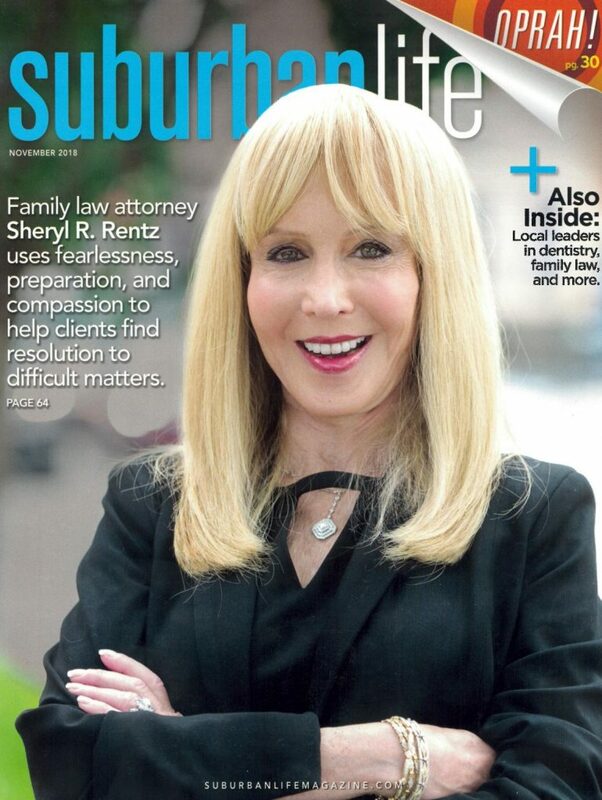 Sheryl R. Rentz has been featured on the cover of Suburban Life, a magazine published in Bucks, Montgomery, Chester, and Delaware counties with a distribution of 50,000 homes monthly. Ms. Rentz gave an interview inside the November 2018 issue. It went on to discuss Ms. Rentz’s background as a marketer for Western Bell and AT&T Laboratories before she achieved her juris doctor from James E. Beasley School of Law in 1991. After receiving her degree, Ms. Rentz went to work in divorce law in the Main Line area, founding her own firm. Today, she has over 27 years of experience in family law, but still finds her business background helpful. A large part of that is helping children. When at all possible, Ms. Rentz encourages divorcing parents to spend equal time with their children “in a healthy way.” In her spare time, she has served as a Pennsylvania Court Appointed Special Advocate (CASA) for at-risk children. Ms. Rentz praised her paralegal, Linda, for supporting her for over 23 years. “Her son, I love and adore. We’re family.” She also extended a thank-you to her “pup,” Carlye Rose, for providing love and comfort to everyone in the office, both clients and staff! If you would like a free initial consultation with the Law Offices of Sheryl R. Rentz, P.C., please give our Ardmore office a call. Ms. Rentz and her staff handle high-asset divorce, mediation, annulment, arbitration, child custody, grandparents’ rights, stepparents’ rights, post-decree modifications, domestic violence, surrogacy, parental alienation, and more. To speak to a Montgomery County divorce attorney, call (610) 645-0100. You can also fill out a contact form and someone from our firm will get back to you as soon as possible. Please view Suburban Life’s profile on Sheryl Rentz here.